Sawyer Valentini (Claire Foy) moves from Boston to get away from her stalker (Joshua Leonard). In doing so, she gets a new job—as we see briefly in one scene where she glibly takes down a customer on the phone—and starts hooking up with people on Tinder—as we see briefly in one scene where she glibly tells a guy that all she wants is a one night stand. When this one night stand ends in Sawyer seeing the face of her stalker in the man she has taken home, she goes to a psychiatric hospital to see a professional. During this meeting, she off-handedly mentions her previous thoughts of suicide. When the appointment concludes, she goes to leave, only to find that the exit papers she signed actually were voluntary committal papers to the treatment center’s psych ward. Sawyer tries fruitlessly to convince the staff that there has been a mistake, but no one listens to her. Stuck in the institution for seven days, Sawyer is advised by fellow patient Nate (Jay Pharoah) to keep under the radar. Sawyer agrees with this plan, until she starts seeing her stalker among the hospital staff. 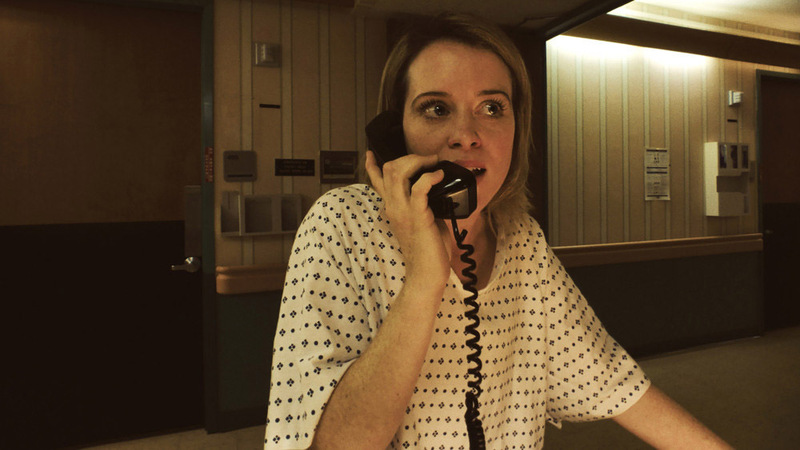 Steven Soderbergh’s Unsane is an experiment. Not one that is new to cinema, mind you. The mainstream auteur’s technique to shoot the film on iPhone cameras has been done before, arguably to greater success, by Sean Baker in 2015’s Tangerine. Where Tangerine augmented its lo-fi camera footage with a heavily saturated color palette, Soderbergh opts for a drab, yellowish palette, with the occasional plot-motivated blue filter thrown in for stylistic flourish. Given that the film is meant to induce an unsettled, queasy dread, this color palette would seem a good fit. So too would the dark lighting and wide-angle shots that come with using the iPhone camera and compatible third party lenses. But stylistically the film does not aggregate to something worthy of beholding on a big screen. In certain shots, the lenses are so wide angle that nothing in frame looks normal or pleasing to the eye. Only when Soderbergh lifts the camera above the actors and peers down on them as if they are lab rats in his loony-bin experiment that the aesthetic normalizes to something that reads artistic as opposed to budgetarily-constrained. There is something to be said about the high contrast lighting schemes that Soderbergh employs. There are scenes in which light appears to be flooding into rooms through the window, and yet no character’s face is properly exposed by the light. This creates an eerie quality to the inside of this facility, in which these patients, particularly Sawyer, appear as invisible prisoners. Then, in a key two-shot later in the film when Sawyer attempts one final time to reclaim her agency, her face is fully lit while another character’s face is starkly in shadow. This lighting motif pays off effectively here. All the same, the style is an acquired taste. Even if one settles into the drab and unnatural look of it, there are only a few shots in the film that provide anything sensational that could liven up the conventionality of the film’s setting. The best shot in the film depicts two characters talking in the foreground and a third character lurking in the far background—the three characters are all staggered in both width and depth. The next shot diminishes the power of this previous shot by making an obvious cue to the lurking figure. This is perhaps the film’s major flaw. It provides opportunities for plot points to function organically, and it places the audience in a position where they have to seek out these cues to fully appreciate the style and plotting. Instead of allowing the audience to take in what is being shown, however, it cues us in with close-ups and inserts. You see a character. You are given enough time to assess that character and how they are presented. Perfect. You are then shown an insert of a ring or a necklace. Once you see that, there’s no doubt that it will come in handy later on. There are multiple Chekhov’s objects in this film; none presented gracefully, none used unexpectedly. Same goes for speech. Characters recite dialogue that feels like it is written on a roadmap as opposed to in a script. Someone mentions a previous opioid addiction in a “throwaway” line. Of course that’s going to come up again. Someone vociferously assures another character that something will happen. Of course that thing won’t come to pass. Someone very pointedly makes reference to keeping things under wraps. Of course things aren’t going to stay that way. Unsane does not fail at being disquieting, which clearly is Soderbergh’s intent. There is an inherent disquiet in the concept of being unheard, of being actively suppressed, and of being hunted all the while. But one cannot help but find the many pieces of this film lacking, so much so that this inherent fear becomes more of a waning pity by the climax. The plot itself is uninspired, to the point where it seems plausible that were it not for Soderbergh’s cultural capital this film would not see 2,000 big screens this weekend. The characters are broad and archetypal—it would be divulging in too many spoilers to address how the only intriguing and seemingly fresh character, Pharoah’s Nate, is derailed by a speedily-resolved subplot. Every other character is simply there to fill a role. Foy plays the victim whose voice is stripped of its validity. Leonard plays the psychologically-disturbed stalker, which he performs with an adequate chill in spite of a script that writes him as a comical caricature of a villain. Juno Temple appears intermittently as a character who acts more like a prison-yard tough than a patient. For what it’s worth, the film dresses itself up in various hats. At first, it appears as if the film may be about how a person gets swept up into the shuffle of a bureaucratic world where no one takes responsibility and thus that person’s problem is never properly addressed. Then, when it is revealed that these bureaucratic actors are actually acting quite consciously as a means of scamming people, the film could conceivably become about how the facelessness of corporate greed strips away humanity to the point where a person’s assailant becomes an after-thought to the corporate agenda. Then again, it could just be a B-movie plot wrapped up in these corporate tensions in a way that does not mesh. The B-movie element of a stalker given free reign to stalk his victim is juxtaposed with a subplot about a corporation’s cynical and callous goal to benefit off the misfortune of others. The two are expected to mingle politely, but they just don’t get along. Either way, the film never properly establishes a realism that justifies the lengths that the plot extends to. Its B-movie ambitions are perfect for the lack of realism that we get. But these other machinations about insurance scams and elaborate stalker conspiracies (which don’t hold up to scrutiny, as far as this critic can tell) are hard to buy into when nothing in this diegetic world comes off as genuine. Part of this goes back to the extreme lens lengths and the drab color design. Part of it goes back to the conventionality of characterization. Part of it goes back to the obvious signposts in the script that pimple into a breakout of contrivances. Mostly, though, it comes down to a sales pitch. I can buy into a world where someone is forced into institutionalized captivity. I can buy into a world where a stalker just so happens to co-exist in this habitat of captivity. I can’t buy into a world that wants to have me believe that this is somehow about more than merely that.